Few brands animate the chattering classes like wardrobe staple Marks and Spencer – especially when the seams appear to be unpicking themselves. So when M&S’s latest quarterly results – the first since an extravagant website relaunch – were disappointing, Radio 4’s airwaves became amplitudinous with the circle-smirking of vindicated business experts. But let’s not pretend that anyone with a little insight might not have smelt the Wise Buys biscotti burning in the oven months ago. If you think £150m would be enough to knock up a decent e-commerce site, you’d be right. Web developers on both sides of the North-South divide will routinely grab an open source solution and get excellent results and have four fewer zeroes on the invoice. Obviously, Marks and Spencer isn’t the average client. It’s a major presence on the high street and already has a strong customer base online and offline, so the launch had to be absolutely perfect. We really don’t know how the figure was reached, but it’s a fair bet that a good proportion of the price went on executives not being quite happy about things they didn’t really understand and the resultant late-night bashing on keyboards by put-upon developers. But even after the collective work of an entire development team and hopefully many hours of testing, the launch was met with consternation. Many would-be customers simply couldn’t navigate around the site. The layout, supposedly attempting to emulate a magazine style, didn’t suit all devices and took the emphasis away from buying. And for some (un)lucky visitors, the site wouldn’t load at all. Online sales plunged by a massive 8% in a quarter. The AGM on 8 July was tense. The company could do little but echo an earlier admission (from a different issue) that they had ‘boobed’. Commentators grumbling about what they see as the decline of M&S is a national pastime. The criticism of the past few years has been that M&S has taken its eye off the core customer as it attempts to chase younger, more fashion-conscious shoppers. But these are the very customers with the greatest number of online and offline options. So while a certain proportion of the fall could be due to a general sense of alienation, such a large drop in a single quarter cannot. So what could have gone wrong? We’ve heard the thoughts of business experts, but are there any technical reasons that could be held responsible? We’ve asked some of our development and marketing people for their thoughts. “With the launch of any new site you always anticipate there will be some initial teething problems, especially on a huge ecommerce site where there are likely to be a large number of redirects or other unforeseen issues. Following the launch of the website in February M&S initially lost around 21% of its search visibility; like I said, this isn’t uncommon for a new site or migration, and over the past few months the company has managed to reclaim most of this, but there’s a good chance this contributed to the fall in sales. Organic visibility isn’t everything though and it’s not hard to find areas of the site where the wider online picture has been missed slightly. I was told that one of their best pieces of content is the ‘bra measuring guide’; the page has a strong organic presence (ranking 4th) but, rather ironically, isn’t supported on the mobile site. There doesn’t even appear to be an option to switch to the desktop version either. 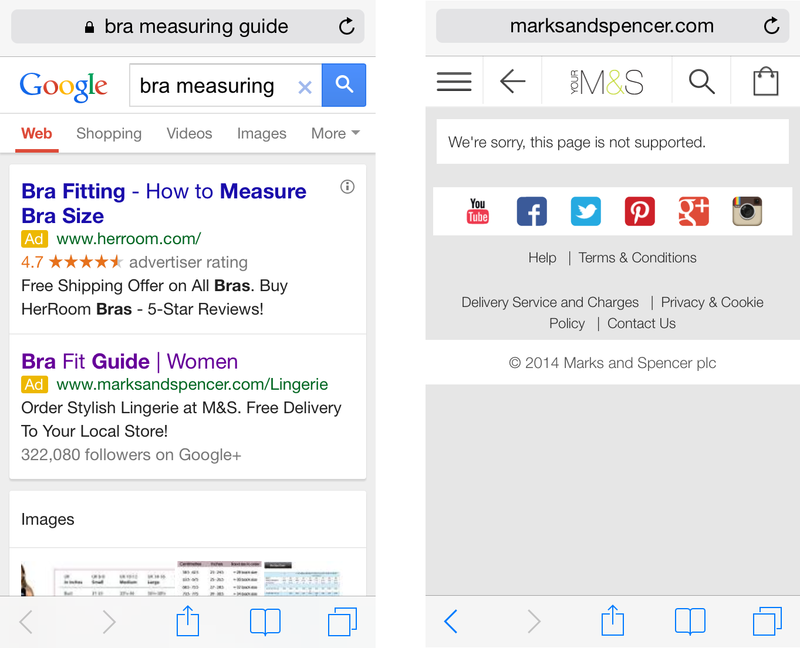 Even more of an oversight from the team managing the online marketing for M&S is that they have specific PPC ads directed to this page – a waste of money as well as a bad experience for mobile visitors. One of the common complaints was the move to a more content and editorial focus. On top of the effect this had on navigation (particularly on mobile), regular M&S customers were unhappy that they had the opportunity to read about which pants are in as well as being able to buy them. For any SEOs or online marketers reading, the word content is probably flashing at you (behave) and we know that this is important from an organic point of view at least. M&S stated that its aims were for the more laid-back visitors, who are likely to enjoy reading fashion advice editorial before they make a purchase. However, some of these moves towards better content have had a technical impact on the site. One the big upgrades from the previous site was the improvement in image resolution, with product images across the site increased by up to 50%. Whilst this may lead to improved user experience and conversion, it does seem to have affected page speed. Though they have approached image caching the right way with content delivery networks there are definitely some compression improvements to be made. Sections such as the ‘why not try’, ‘other users liked’ and ‘you may like’ all take a while to load and we’ve seen a lot of site users commenting on general slow loading page issues. “From a pure technical SEO point of view, the M&S site has been put together by someone who knows what they’re doing; hreflang (edit: albeit an inconsistent implementation), use of Product/Offer Schema, OpenGraph tags, some common page speed optimisations including CDNs (plural). 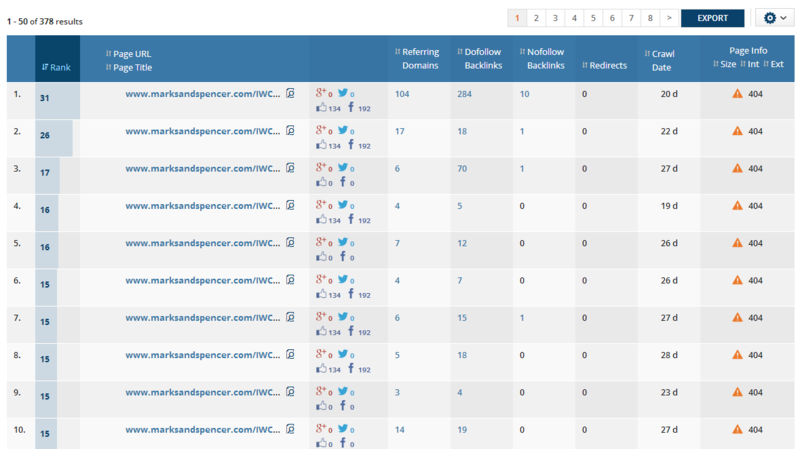 Someone’s been reading their Moz.com very hard, although they’ve been naughty in the past with video sitemaps. In most respects, it’s superior to the semi-bad but very dominant Next website – except with respect to page size. With cache disabled, you’re looking at 1.1Mb to 1.5Mb for a category page – compared to 600Kb for a typical Next category page. Admittedly, they do reduce the size for mobile browsers (around 700Kb) although they could probably beat that down. Then there’s the migration to the new site. When you change sites, your old URL the shirts page, which might have been marksandspencer.com/shirts/ could change to something like marksandspencer.com/clothing/shirts/. A lot of people will be linking to the first link – historically. It’s common sense that you would want to keep your old links in place by redirecting the old URL to the new instead of serving an error page. Looking at just URLs beginning with www.marksandspencer.com/IWCatProductPage.process (their old product page URL), you’ll see that they have external links to a 378 dead pages from 256 domains. Does an external link to a 404 page still pass link equity? I don’t think so. Marks and Spencer does have a metric ton of broken links. Is it on purpose? Have they lost link equity? I don’t know. Their broken external links are a real mix of quality – some I’d like to keep; some I wouldn’t. A domain the size and age of M&S is going to be pretty resilient though. Showing up #2 in the search results can often get you less than half of the results of the #1 result – every bit of link equity can make a difference. I’m not keen on how they do this. Boys’ blazers category 1 and category 2 and category 3. Three category URLs, same thing. This isn’t cherry picking – they do this a lot. M&S lets you access its products in different ways. i.e. I approve of the approach but think they should merge the 3 pages either by changing the internal link or use of a canonical tag. Google’s much better at handling this now but it’s possible they’re diluting the amount of authority each page gets. Historically, this was the case. Finally, putting on our conversions hat, I think that M&S could learn a lot from eBay. M&S’s internal search does have autocomplete but it’s not very good i.e. entering “Women” for some reason doesn’t prompt women’s shoes. The autocomplete suggestions don’t even take you to their optimised category landing pages, just a generic search page. 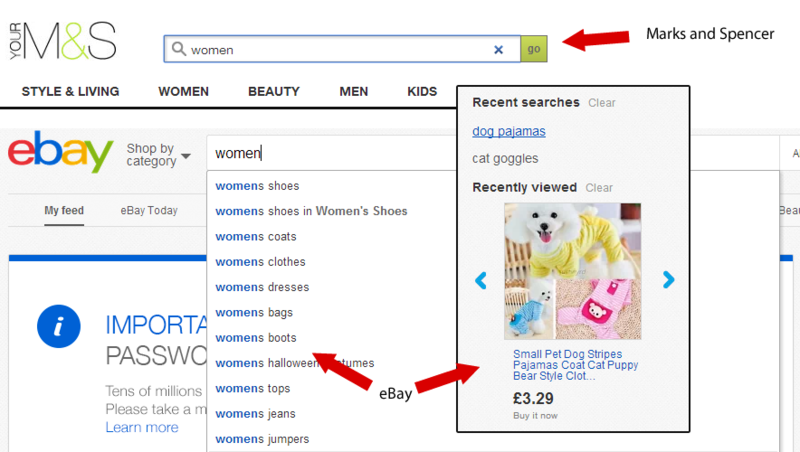 eBay’s homepage gives users a customised experience when logged in and benefits for doing so such as wishlists and monitoring prices. But one of my favourite features of eBay is how they remember what items you were viewing when you come back to the page. So M&S has had a disappointing first quarter in terms of online sales. It’s easy to point to its new website as the reason behind this, and whilst we’ve picked out a short list of quick fixes that could improve performance and experience we’ve got to say that from a technical point of view it’s largely well structured. That’s often a difficult task for a large ecommerce site. Obviously the switch to a content-led site over their traditional product focus has had some impact, both on user journey on the site and also on perception; with the loudest opinions mostly negative towards it. (Though we all know bad reviews rise to the top – even on your own site!). We’re hoping to take a deeper look at the user experience issues within the site as this should help us to evaluate just how M&S customers are finding the new site. Until then we welcome your comments and feedback.